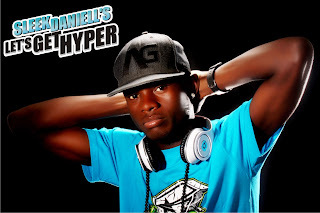 Hailing from the capital city of Akwa Ibom state Sleek Daniell’s, Born Daniell’s Enoh has an unquantifiable passion to make music and entertain. Sleek Daniell’s attended Oloye Private school in Surulere, moved to Oloye Comprehensive College where he obtained his first S.S.C.E and now studies at Lagos state University for a B.Sc certificate in Communication Technology, still armed with a diploma and certification from other professional courses. describes as circumstance beyond control but this served as a catalyst and created a strong foundation for him as a musician.. He is back with a new single titled ‘Let’s get hyper’, a huge party starting track. He has had a fair share of collaboration with fast rising, A list and International artistes including Lady Rapper Tifflon based in the states on the track titled ‘My Style’, Pasto Goody Goody on his own track titled ‘Afo Ikpon’ . He has worked with producers like Samklef, Teekay Beats and LuciousBeatz.